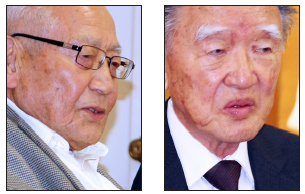 Three atomic bomb survivors to speak at Sept. 10 presentation. TORRANCE — Three atomic-bomb survivors will share their experiences at “Shadows for Peace” on Saturday, Sept. 10, from 2 to 4:30 p.m. at the Torrance Public Library’s Katy Geissert Civic Center Library, 3301 Torrance Blvd., Torrance. This forum is in remembrance of the over 250,000 who died instantly in the August 1945 atomic bombings of Hiroshima and Nagasaki or soon after as a result of radiation poisoning. Hear personal stories of survival from the hibakusha, as only they can share the experience of the only atomic detonations on human targets. Gain historical insight to “Fat Man” and “Little Boy,” as the bombs were referred to, and learn how nuclear research resulted in medical advancements that impact society today. This forum is not intended to debate the whys or wherefores of dropping the A-bombs on Japan; the goal is to give voice to those who experienced the horror that took place beneath the mushroom cloud and to celebrate their resilience. Presenters include three Hiroshima hibakusha: Junji Sarashina, Wataru Namba and Toshiharu Kano, who was in his mother’s womb on Aug. 6, 1945. Video addresses include fellow hibakusha Kaz Suyeishi, Hideo Sakata, Yoshino Yamada and Howard Kakita. There will also be a video address by Dr. James Yamazaki, author of “Children of the Atomic Bomb,” who in 1949 was the physician-in-charge of the U.S. Atomic Bomb Casualty Commission at Nagasaki. He served as a combat surgeon at the Battle of the Bulge, where he was captured and held as a prisoner of war by the Germans. The event will wrap up with a Q&A panel. For additional information, contact Richard Fukuhara at [email protected] or leave a message at (714) 998-8790. Shadows for Peace forums are produced by Fukuhara and Robert Horsting.